This has been quite a weird year for gaming, especially when it comes to some things that have come from a handful of upper echelon game developers. Pokemon Let’s Go, despite receiving generally favorable critic reviews caught its community off guard with the new take on the decades-old franchise. Of course, nobody will forget the debacle surrounding the announcement of Diablo Immortal, a new mobile-exclusive Diablo entry, at Blizzcon just a few weeks ago. But before that, Bethesda teased Elder Scrolls 6 at E3 2018, alongside Elder Scrolls: Blades, a mobile game, as well as Fallout 76, a new multiplayer Fallout experience. Fallout fans were immediately confused and upset by the news, but some people (including myself) decided to at least give it a chance before immediately dismissing it. After all, Bethesda is known for creating respectable games despite the tendency for the bugs therein to be meme-worthy, right? After a very short (and apparently lukewarm) BETA session, Fallout 76 released to the masses on November 14, 2018. Before picking up my own copy, I waded through countless BETA impressions across the interwebs. The majority of opinions vented in those impressions were negative, but for some reason I still needed to experience it for myself. With that said, Fallout 76 IS functional but is, unfortunately, a mess. My primary issues lie with the combat, which I’ll go into in detail after briefly touching on some other things first. The story in Fallout 76 is light, but I think everyone expected that based on what they had given us prior to release. That in itself might be an immediate turnoff for some people, but I’ve enjoyed previous Fallout games immensely for both their story and exploration components. Because Fallout 76 is apparently four times the size of Fallout 4 in terms of terrain, I’m not too concerned up front about running out of thing to see, at least for a while. Fallout 76 has you emerging from Vault 76, 25 years after being forced within after the bombs fell during the Great War. Apparently, yourself and other vault dwellers were tasked to reclaim and rebuild America from the ashes of the war. However, it seems as if you were late to the party and nobody, including the overseer, is to be found. With nothing more than a hunch as to the whereabouts of your former overseer, you brave the unknown in hopes of finding them, someone else, or anything really. This front-loaded portion of the plot is then continued through via audiotapes and hand-written notes, at least based on my personal experience thus far. I haven’t gotten far enough in to say with confidence whether that ever changes, but the general consensus around the block is that the formula doesn’t change much, if at all later. On one hand the lack of NPCs definitely gives off an extreme feeling of isolation and loneliness, which somewhat makes sense given the nature of the landscape and the events that unfolded a few decades beforehand. But I could certainly see it feeling a little too lonely at times given the lack of NPC interaction. Of course, you can always team up with other player-controlled survivors, but that has its own pros and cons. I haven’t done much group content as of yet, but I can see the value of making friends to take on or explore certain things while also having the ability to peel off and immerse yourself in something alone. There is little noticeable difference in the graphical fidelity of Fallout 76 compared to 2015’s Fallout 4, at least to my eyes. 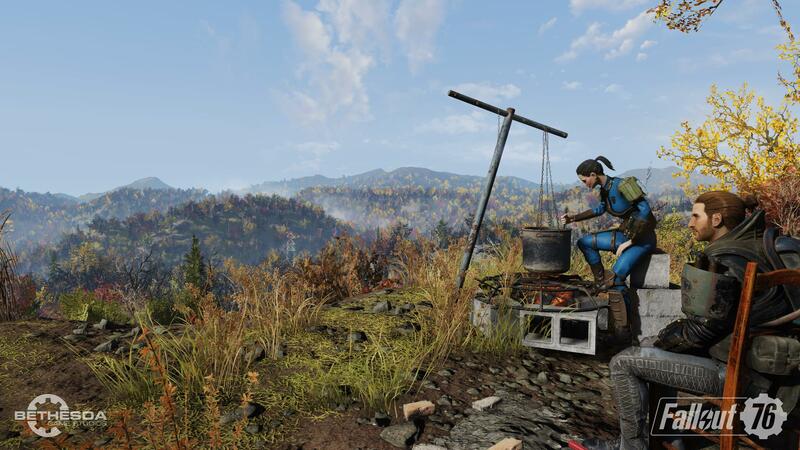 While the team did a great job of building out and making West Virginia looks interesting, it still feels more like an extension of Fallout 4 than anything else. If you liked the look of Fallout 4 then you’ll probably be fine with 76, just don’t really expect anything above that caliber of graphics. And with mod support not arriving for at least another year, 76 won’t look near as nice as a fully-modded Fallout 4 can for quite a while. One last thing concerning the graphics that was particularly annoying to me was the inclusion of depth of field, which cannot be disabled without tweaking the ini files. While that only takes a few seconds to do, it would have been nice to be able to toggle it in-game. The sound package present in Fallout 76, however, is another thing entirely. In short, you never have to worry about music in a Fallout game when Inon Zur is at the helm. There’s not much that can be said about it besides the obvious here- he delivers another fantastic score in Fallout 76. 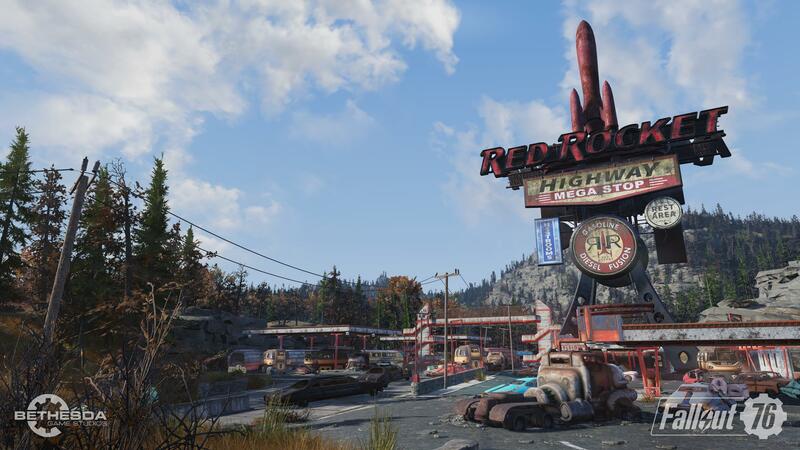 Fallout 76 very much uses the same systems for crafting and building found in Fallout 4, with a few minor tweaks here and there. Most notably is the ability to set up a camp almost anywhere in the game world that can be tailored to your liking, and can even be moved around for a small fee. This is a must-have even for those disinterested in building on a grand scale, as it gives easy access for offloading cumbersome materials and, eventually, the ability to craft things from your base at any time. Now here is where things really start to break down for me in Fallout 76. I can take an “okay” story and “okay” graphics, but if the combat is broken, uninteresting, or both, then we have a serious issue on our hands. Sadly, if you’ve been on the Bethesda train for some time now you’ll know that some of the things ahead are not really “new” problems. Melee combat, although very powerful as of right now, feels really bad in execution. I’m sure server stability plays a role in it not being very precise, but it’s also a design and engine flaw that has been prevalent for years now. The hit detection is just not good and really shows the age of the engine that’s under the hood. Unfortunately, the melee jankiness isn’t even the worst part of combat, for that medal goes to enemy AI. Simply put, it is an absolute joke. Many times, enemies will not attack you at all, or get caught in seemingly invisible terrain. It happens far too often and immediately breaks both the immersion and any potential traces of challenge within the game. Bethesda’s obsession with re-using large portions of their design throughout the years has really come to a head in Fallout 76. But don’t get me wrong, I’m not suggesting a brand new engine (though that would be nice). But geez, if you can’t get some of these buggy things right with a decades-old framework, what exactly are you doing? Again, Bethesda is known for rolling out buggy content, but Fallout 76 really does not feel like a finished product right now. And that is sad because I do like the idea behind Fallout 76. I don’t mind that it is light on story and void of meaningful NPCs as long as there plenty of things to see and discover in West Virginia’s wilderness. I don’t mind that the game uses dated graphics since mod support is coming in the future. But at the very least, something has to be done about the AI. How it could possibly be worse than Fallout 4 or Skyrim is beyond me, but it is. I have a feeling that the hit detection in melee combat will improve slightly with server stability, and perhaps they’ll tweak some other things to fine-tune it even further. Unfortunately, I imagine that the AI will require more work than that, but it has to be done. As it stands, there is little reason to buy Fallout 76 in its current form unless you’re really itching for more Fallout. Even then, the issues with the AI alone may serve as a detractor from truly enjoying it. Perhaps a while down the road, after patches have been rolled out, we’ll have another situation on our hands, but for now it is safe to skip it. That said, I’m still very early into my journey in Fallout 76, and I’m not entirely giving up on it just yet. Should things change for me later, I’ll be sure to let you know. Have you picked up Fallout 76 yet? If so, what are your thoughts and/or experiences with it so far? Let me know! This looks like the first Fallout game I simply won’t buy. I’ve bought Bethesda’s games over and over in the past, but I’m not going to touch this one. Bethesda, you can do better! I sincerely hope that the backlash they are receiving from this whole debacle will force them to change up the formula a bit with their next game, whatever that may be.